Raising creative children can seem like one more box to check off on the list of parenting to-dos. It’s tucked somewhere in between making sure they have decent table manners and know the answer to math questions such as 8+5? As a parent, I know it can feel overwhelming to add one more item to that parenting to-do list, and raising creative kids can get placed on the back burner for a variety of reasons. Maybe you are uncertain as to how to go about providing creative opportunities for our children at home, or perhaps the idea of the “mess” that comes along with the combination of creativity and children feels extremely overwhelming. These fears are real. Overwhelm is real too, especially in our modern-day lives that seem to be fraught with the buzz of busy-ness. However, what if the key to combating that feeling of overwhelm was more creative time with your kids? 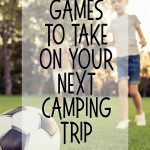 More time to connect, take it slow, dive into a deeper conversation, and take a moment to help your children process all that keeps them busy? As a family with two kids ages 3 and 6, with work, school, volunteer obligations, household chores that need to be done every week and meals that need to be made every day, our family is busy. Very busy. It seems silly to want to add one more activity to our already packed days but we have actually found that adding in a daily ritual of art-making created time that is peaceful and calm, and less overwhelm, even with the extra “mess” that inevitably results. Embracing the mess doesn’t mean you have to have paint splattered walls or glitter stuck to your sofa. It means creating a structure for the creativity to safely happen within and allowing the mess to happen in the first place, because let’s face it-mess happens whether we want it to or not, so why not plan for it? 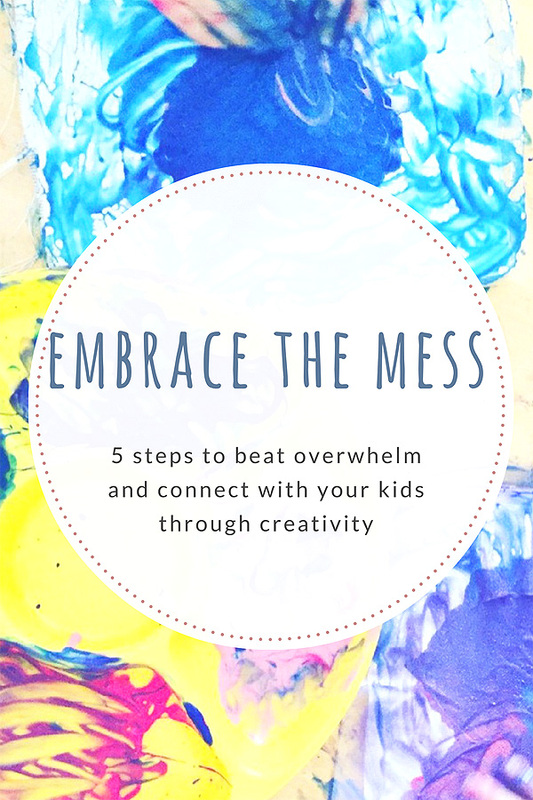 In embracing the mess and creating more opportunities for creativity in our daily lives we have found a deeper way to connect with our children and as a family. Turning creativity into a daily ritual has been the key to making art time with our children less overwhelming and an experience we all look forward to instead of dread. You can bring in more creative time into your family life too without fear. Here are the 5 actions we took to invite in more creativity and say no to overwhelm. 1. First things, first. Designate a Space. You could make art at your dining room table, kitchen counter, or on the floor of a patio, or perhaps you have an entire room to dedicate to art-making. However you go about selecting a space in your home, make it consistent. 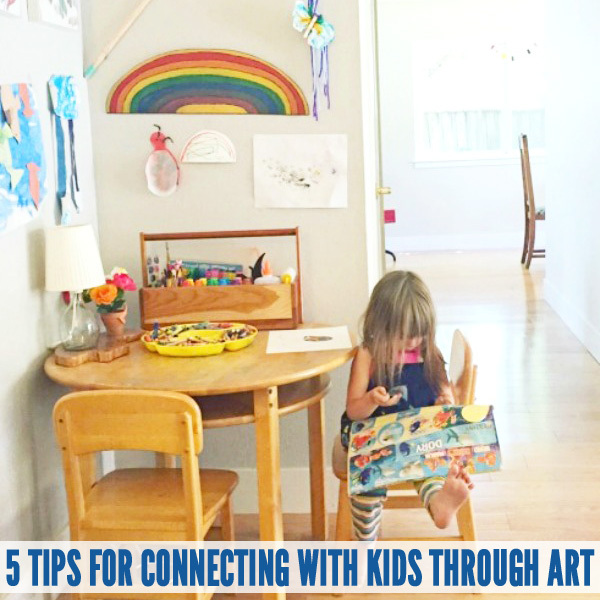 Having one location in your home where the art making happens creates natural guidelines for children and helps them to learn your expectations of behavior and conduct. It will take a few tries to establish with your children how to behave in your chosen art-making space, but like with anything repetition is the key to success. Once you have established where you will have your art making sessions, establish a set of simple rules that go with that space. Maybe your rules include all the art materials are to stay in the room, or on the table, or on your tarp on the floor (we call our paint tarp the magic carpet, because that’s where the magic happens). Include your children in the process of what they want their art time to look like. Perhaps your children would like to include some calming music to play, or they might like to diffuse a scented oil (my kids love lavender). Helping to choose a space and making choices about what is included in that space brings ownership to the process for your children, building their investment into the overall concept (even if they are very young). Plus, having a designated space for your art making keeps your materials handy, cuts-down on the mess, and centralizes where the mess takes place. Making the overall art making process less chaotic. 2. Now, for the fun part – Designate Supplies. Just like having a designated space for art-making having designated art supplies for that space is equally important. Stop pulling the scissors out of your junk drawer every time you want to cut a piece of paper for your kids. 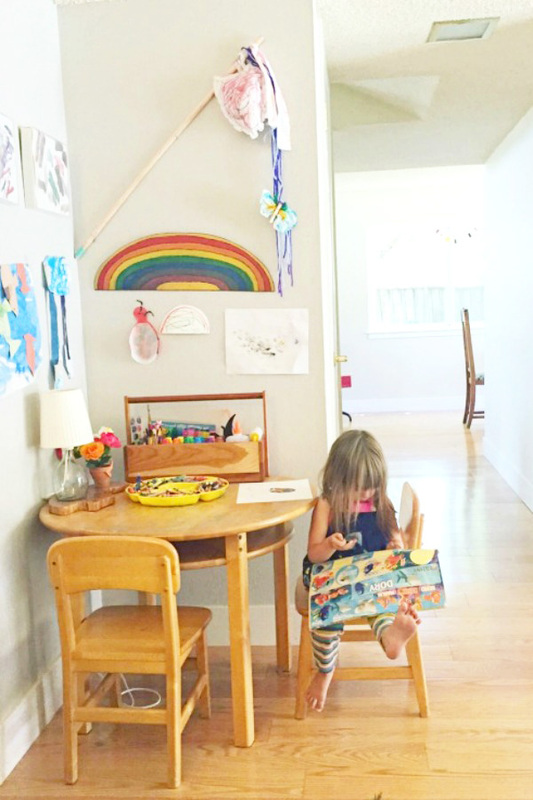 Include all the supplies that you as the adult will also need on hand in your kid’s art space. By having your supplies readily available, in limited quantities, and stored in a way that makes art making easy you will find the process of setting up art projects, or offering open-ended art making time with your children easier and less stressful. Plus, having a spot for each art supply makes clean-up so much easier too. 3. Simplicity is Key- keep your supplies, projects, and expectations simple. 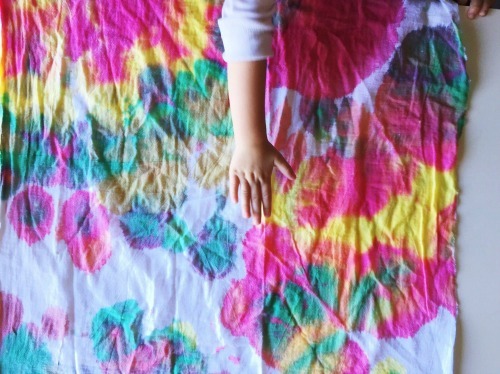 With a mindset of keeping things simple you will find setting up art experiences for your children won’t require a ton of time, and won’t cause your children (or yourself) to end up in tears either. Offering very specific supplies creates a structure for you and your children to work in, which will up your children’s creativity and increase their focus by keeping overwhelm at bay. Keeping your overall supply cabinet limited to your favorite markers, crayons, watercolors, and paper can keep the art experiences less demanding, and simpler overall. Offering children just a few choices when it comes to art making reduces the overwhelm of making decisions and keeps the focus on the art-making experience. 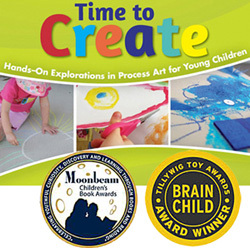 In the beginning offer art projects that are open-ended and process-based, meaning there is not one outcome or product your child is expected to produce at the end of the art experience. For example, set out watercolor paper and water colors and brushes and invite your child to engage or provide a mat with a large ball of clay and a few clay tools for your children to engage with. As your children gain exposure to a variety of art-making sessions they will build their creative muscles, and begin to create more complex projects on their own. Providing open-ended projects helps to keep expectations of the art experiences low, which reduces the overall stress of the experience. It’s okay if your child isn’t interested in the art-making the first, second, or even the third time your offer art time to your children. Children can take many exposures to a material and art experience before they will jump into it. It’s a lot like offering a new food to a child. At first, they won’t try it. Next time they might take a small bite, and the following time they might eat all of it and ask for more. Taking the gentle and simpler path provides your children with positive associations of the art experiences, making them more likely to be willing to try it again at a later date. 4. Designate a Time of Day – Daily Practice. Any habit requires time invested. The more you do something the more of a habit it will become. 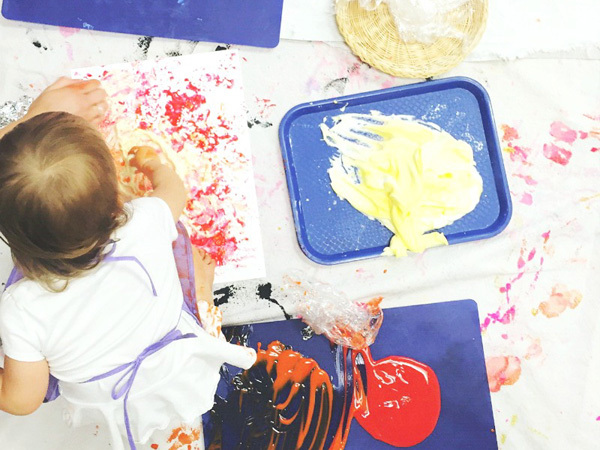 Many parents find their first several art experiences with young children to be frustrating, or chaotic. 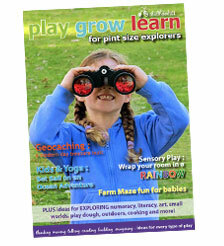 Children don’t wish to engage in the materials, or they engage for only a few moments before they are off and running. Providing consistent opportunities for your children to create helps build their stamina, introduces them to the materials, and provides a rhythm for them to know what to expect. Children love repetition, and the very young child can explore the same art material again and again for days before they grow weary of it. For example, the material you want to introduce is clay. You could continue to offer clay and the same tools all week, only changing out the tools weekly for the course of one month. The following month you might change the main exploration material from clay to watercolors. Your children will need your guidance and supervision during their first several art experiences but by the time they are three -years old, with consistent time being spent daily engaging in art making you children will need your guidance less and less and you will begin to be able to follow their lead. Creating a daily art ritual, no matter how simple it is, can offer a respite in your day. It’s a wonderful time to sit down and talk with your children. Talk to them about the supplies you are using, the project you are working on, the choices they are making in their projects. Your art time can become a ritual and one that invites an element of calm into your busy days. 5. Follow Your Children’s Interests. Thinking about what our children find interesting can be the best guide as to what kinds of projects and art experiences to offer. Really considering how our children like to interact with other elements in their lives is such a great guide to figure out what kinds of projects to share. There are so many resources to help develop wonderful creating opportunities, such as Pinterest, Instagram, or even doing a basic Google Search. As an art teacher, I love pulling projects from books by trusted arts educators. 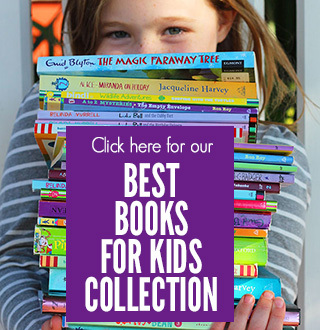 You can see my list of 5 of the best Art Ed Books for Families in this post. Not sure what interests your children? 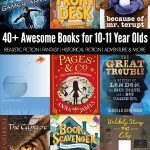 Consider doing projects based on favorite stories or books. Incorporating the story element helps to engage children deeper as they make connections and keep their focus on the concepts shared in the story. 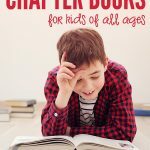 Plus, following your children’s interests through stories provides even more opportunities for you connect and create positive memories together. About Julia: Julia Linsteadt loves exclamation points, glitter, and helping families get creative with their children. 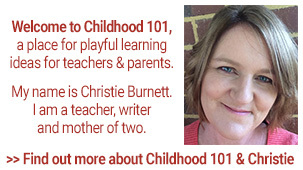 She teaches art to young families in the San Francisco Bay Area where she lives with her two children and husband who have bravely embraced the mess of living a creative life. Connect with Julia on her website Cut Outs Kids, or via Instagram, Facebook or Pinterest.